This page is about Blewbury’s water, which originates on the North Wessex Downs and forms the village’s springs and streams. Blewbury can trace its geological history back 350 million years. However, most of the visible features of the village and its surrounding area are the product of weathering and erosion since the last glacial period, 12,000 years ago. There is evidence that people have been living here for about 4,000 years, supported by the local springs and streams. The downs above the village are made of porous chalk rock, and there are no ponds or streams. 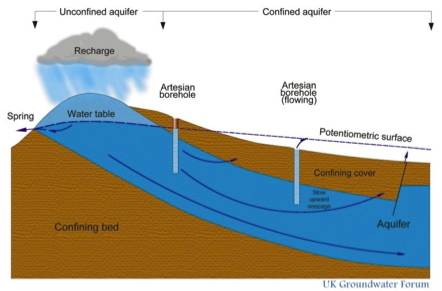 Rainfall falling on the chalk percolates slowly down to the water table, dissolving carbonate minerals, to create the chalk aquifer which is the main source of our drinking water. The diagram below illustrates the situation. From the 1950s until 2007 Blewbury obtained its water from boreholes located at Lids Bottom, just south of the village, derived from aquifers in the chalk and Upper Greensand. Our water is now supplied from deep boreholes at Gatehampton, near Goring, still taking water from the chalk but blended with water from the Thames. These boreholes are among the most productive in Britain and supply other towns in Oxfordshire and as far away as Swindon. The chalk groundwater is excellent-quality hard water, naturally rich in calcium. The long residence time of the water in the chalk provides some protection against surface contaminants, and the water requires little treatment. Apart from initial filtration, routine chlorination is carried out as a precaution. Further details on the water quality may be found on Thames Water website, including a chemical analysis: my.thameswater.co.uk/dynamic/cps/rde/xchg/corp/hs.xsl/899.htm. Blewbury has a long history as a spring-line village at the foot of the North Wessex Downs. The springs originate from rainfall on the downs, and their flows can be influenced by the water table as far as 5 km away. The springs have supported settlement for at least 4,000 years. The Lower Chalk from which the springs issue has been used for clay in walls and buildings in the village. 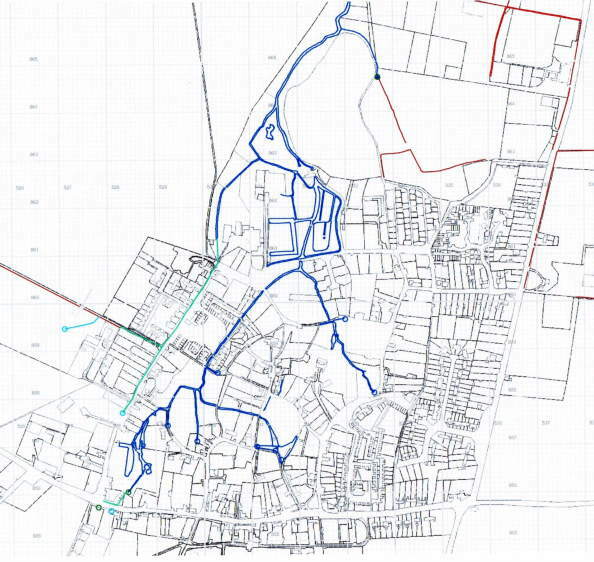 The map below shows Blewbury’s waterways, including new springs that appeared during the very wet year 2001. Water provided the first renewable energy to be used in Blewbury. 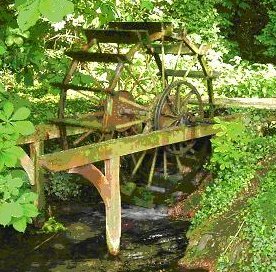 A water wheel, shown at right, was installed in the late 19th century to provide electricity for Ashbrook House – the first use of electricity in the village. 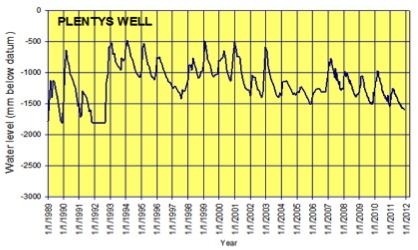 Since 1989 we have been observing the water levels in one of Blewbury’s traditional old wells – the graph below covers the full period of 23 years. This has supplemented the information on stream flows and groundwater levels maintained by the Environment Agency. We are studying the hydrology and biodiversity of the whole of the Millbrook in Blewbury Parish, and have started with surveys of the invertebrates and fish. Water voles have also been sighted in our area and control of mink is also being considered. Blewbury School has been involved in first stages of the project. Funding has been obtained to improve the biodiversity and landscape of the Cleve, one of Blewbury’s iconic landscapes, which has undergone sad decline in recent years. A key to improvement may lie in the removal of some or all of the silt. There is more information about the Millbrook project on our environment page. When the Rivers Run Dry: What Happens When Our Water Runs Out?, by Fred Pearce, Eden Project Books (2007). Virtual Water: Tackling the Threat to Our Planet's Most Precious Resource, by Tony Allan, Tauris (2011). A View from the Hill, edited by Peter Cockrell and Shirley Kay, Blewbury Village Society (2006).